I’ve never been a big hybrid fan. I prefer the look of an iron behind the ball, which makes me the target market for PING’s new Crossover iron, which the brand reps were struggling to get out of my hands on a recent launch. But at some point I had to test the new Ping hybrid - and what a surprise I was in store for. Turbulators have made their way from the G30 driver onto the G hybrid. The feature is designed to improve club aerodynamics in the driver and fairway wood, but this is not the reason they have been employed on the rescue club. Instead, PING is responding to requests of customers who asked for continuity throughout the woods. There is a performance benefit however, as it helps players line up with their intended target. White grooves on the face are painted black where the club’s sweet spot resides, to help people find the middle of the bat. The carpenter 455 steel face has a square profile, while the head looks sleek at the address position. Overall, the aesthetic is both classy and understated. It should appeal to the masses. The G hybrid has a very soft feel off the face. Clearly, you do not get the same responsive feel provided by an iron, but we’d be happy hitting this all day. This is one of the most forgiving hybrids on the market. 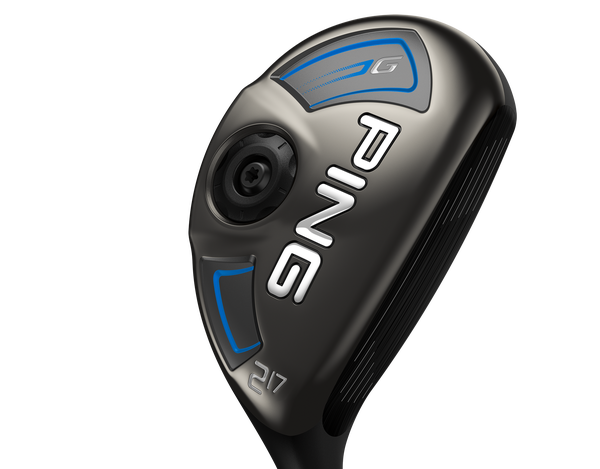 From all over the face, and from both the ground and the tee, the PING G hybrid is easy to get in the air, and offers heaps of help. Like the G driver, this club has a thinned-out crown and face, which allowed designers to move CG lower and further back in the head. It is naturally very high launching, which is great for attacking greens. Like the fairway wood, the G hybrid has a lower leading edge, making it very easy to get the ball of the deck. In the distance stakes it also excels. A cascading sole engages more of the face at impact, allowing for more face flexing. We were regularly sending the ball out over 200 yards on a frosty morning. The G hybrid is so remarkable it may have made me a hybrid player. Incredibly forgiving, long and it boasts a soft feel. It ticks all the boxes a hybrid should, and also boasts classy aesthetics. This should be another popular product from PING in 2016.